Jan 13, 2017: 4 Input XLR Mixer? Jan 13, 2017: What's Your Rig for Live Gigs? Jan 24, 2017: Recording multiple USB mics via audacity? 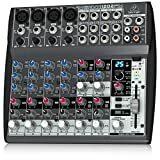 Apr 29, 2017: Is this a good mixer for my setup? Jul 03, 2017: What is the difference, which to choose? Jul 25, 2017: Is it possible to hear PC/PS4 at the same time? Sep 08, 2017: Syncing these synths? Also a dumb question about mixers. Sep 15, 2017: Affordable multitrack (4 xlr inputs) recorders/ mixers? Nov 18, 2017: Splitting Audio to Live (YouTube, Facebook, Periscope, etc) Feed? Dec 13, 2017: Is video more lucrative than audio? And is it possible to record and stream from same microphones at the same time? Dec 13, 2017: Will a mixing console add audio degradation? Jan 20, 2019: What do I plug this FX Send port into anyway? Feb 11, 2019: What kind of mixer goes between the controller and the speakers?